This is a recent discovery out of the Philippines. Its a 21 foot, 1075 kg saltwater crocodile they are calling Lolong. They found him during a hunt for a croc that killed a fishermen and his daughter. They have not confirmed if this was the crocodile responsible for the 2 deaths. It took the efforts of 100 people to pull him out of the water. 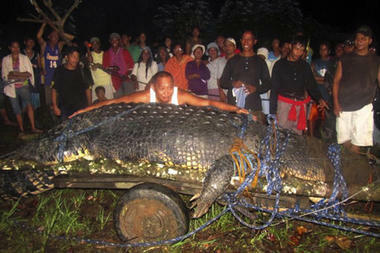 Lolong is still alive and will be on display in a new ecotourism park. This may not be the last monsterous croc they catch. The people of Bunawan (500 miles southeast of the capital Manila and the town where Lolong was captured) say there is a bigger one in the area. If you find this interesting and like giant reptiles click here for our other story on giant alligator snapping turtles. This is a news which is a bravery, effort from the people.This entire effort will be published in best essay writing service from an expert.Since hunting of Crocodile is not a small thing.Hats off to the people who involved in Hunting.